Nearly 500 years ago, Little "Bo Peep" was told of her sheep to "Leave them alone, and they'll come home, and bring their tails behind them." But there are actually five verses to the poem, which explain what happened next (and why the syntax was so garbled in the first verse). It makes more sense when you read the Wikipedia entry. 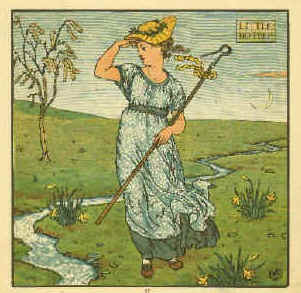 "Bo Peep" was a customs house on the south coast of England. She didn't know where to find them, but was told to leave them alone and they'll come home, dragging their "tails" behind them. And the final verse makes more sense as a description of a dutiful British customs man assessing the abandoned booty.